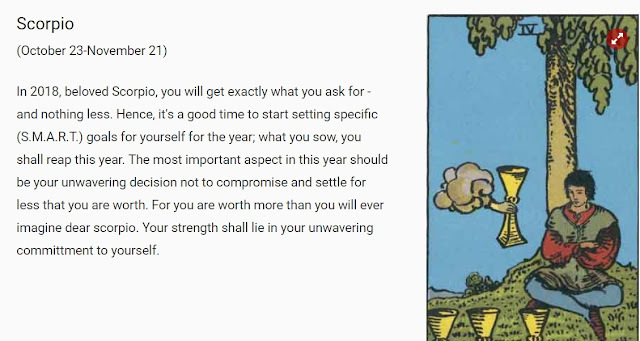 I am one of those people who like to read about tarot cards and astrological forecasting. Though I do not believe it 100%, I think that we can all use it as a guide of sorts. For 2018, this is what the cards has in store for me. So let's go ahead and set some REALISTIC and ATTAINABLE goals shall we? 1. Health wise, I will work on trimming down my weight. 2lbs a month is doable I believe. I just need to eat healthier and drink more water. 2. Spend less on wants and save more. I am targetting more than Php100k in savings. 3. Purge what is unnecessary in terms of everything. Books have already been taken cared of, happy meal toys and notebooks as well. I think it's time to let go of some of my make up and then finally, my arts and crafts materials. 4. Spend more quality time with my son and my family. 5. Nurture my new found relationship and make sure that it works because I want this to be my lifetime love. 7. Travel to 3 new countries. There. I think those are specific enough. Cheers to 2018.